Why does ECE need a new building? A new building will consolidate the department, address critical space needs, enhance instructional and research capabilities, and help us to be more competitive in attracting top students and professors. It will also equip our incomparable faculty and students with the modern facility they need to innovate and lead. The total cost of the entire project (including lab equipment, classroom furniture, etc.) is estimated to be $95 million. The cost for the construction of the building itself will be around $71 million. How will the new building be financed? The State of Illinois will provide $47.5 million toward the building, and the department is seeking private and industry support for the balance of the funds required. In addition, foundation and federal sources of funds are being pursued. The building will complete the north engineering campus quadrangle. Land has been reserved between the Micro and Nanotechnology Lab and the Beckman Institute for Advanced Science and Technology. The Coordinated Science Lab is just east of the site. This is an ideal location, as it places the ECE home building in close proximity to other existing ECE research and collaborative programs. See the map. How big will the building be? 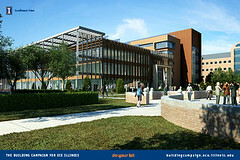 The new ECE building will be approximately 230,000 square feet. What kinds of instructional spaces will the building contain? How efficient will this new building be? The new ECE building is targeting LEED platinum certification, the highest rating for efficiency. It has an additional goal of being a net-zero energy building, meaning that it will have systems in place that over the course of a year will produce as much energy as the building uses (see Project Details for more on this). The building is currently scheduled for completion in mid-2014. Classes will begin meeting in the new building for the fall 2014 semester. What will happen to Everitt Lab and the labs within? Everitt Lab will continue to be an important building for ECE and the College of Engineering. Engineering and other classes will continue to meet there.